Nine points separate the top eight spots in the MLS West. 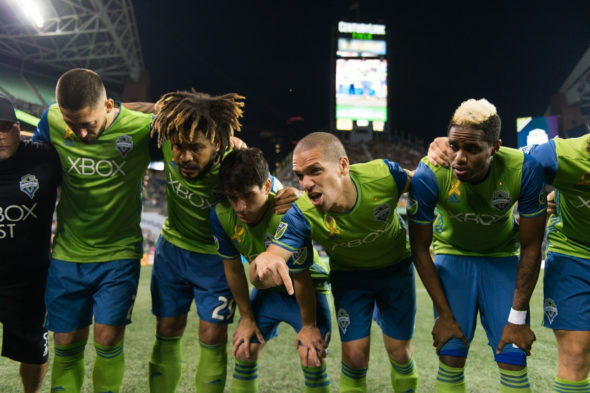 The Sounders seek to keep the math simple by locking up a playoff spot Sunday at home against Dallas. Unlike in the east, where last year’s MLS Cup runners-up Toronto FC (19-5-8, 65 points) have set a blazing pace and already claimed the Supporters’ Shield, no team in the west escaped the pack (MLS standings). The Vancouver Whitecaps (15-11-6, 51 points) hold the top spot, with Sporting Kansas City (12-8-12, 48 points) second. Portland (13-11-8, 47 points) holds the tiebreaker with the Sounders by virtue of a greater win total. In fifth sit the Houston Dynamo (12-10-10, 46 points), with FC Dallas (10-9-13, 43 points) rounding out the current playoff picture. Lurking below Dallas, however, are Real Salt Lake (12-14-6, 42 points) and the San Jose Earthquakes (12-14-6, 42 points). A win from either team this weekend and a Dallas loss Sunday in Seattle would push the Texas club out of the playoff picture heading into the final games of the regular season. Coach Brian Schmetzer, whose team closes out the regular season at home against 10th-place Colorado (8-18-6, 30 points) Oct. 22, said his defending champions held the West lead for a time, but couldn’t sustain it. Lineup consistency is in question for the Sounders, who have missed Osvaldo Alonso and Jordan Morris in recent matches due to lingering muscle strains. Schmetzer described both as day-to-day. Roman Torres, who had not played since Seattle’s Oct. 1 loss to Philadelphia with an undisclosed injury, was healthy enough to score the game-winning goal for Panama Tuesday to spur his country to its first World Cup next summer in Russia, a result that also helped eliminate the U.S. for the first time since 1986. With dozens of possible outcomes, Schmetzer was clear about his goal Sunday: Win and guarantee a ninth consecutive season of playoff soccer, and worry about the standings later.